Maria Wolfram is an internationally renowned Finnish artist, in whose work, identity, equality and power are recurring topics. Materiality and an experimental approach, often spiced with humour, are important elements for her. “I am excited by the adventure that begins in my studio and continues in the mind of the viewer,” Wolfram says. She gained her Masters in Fine Arts from Chelsea College of Arts, and has since exhibited installations and paintings around theworld. Today, her work is in collections in cities such as Zurich, London, Amsterdam, Paris, Tel Aviv, Hong Kong and Sydney. “I get fired up by the fact that history has only partially covered the roles women have played in society since ancient times,” Wolfram says. “It’s common to assume women only took care of the household, because that’s the narrative in our history books. In fact, women have always been active in areas such as politics, trade and art. As long as so many fascinating stories of women remain untold, it’s much harder for girls and women of today to discover role models to help them reach their full potential,” she argues. Wolfram draws inspiration from folklore, patterns and symbols. 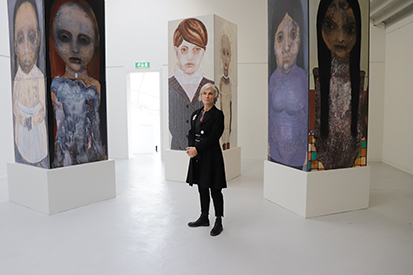 Since visiting the Finnish Institute in Athens as artist-in-residence in 2017, she has developed a particular interest in Greek mythology and sculpture. “Meeting people from different cultures and getting to know new visual environments act as a great catalyst once I’m back in my studio in Helsinki,” she explains.